Objective: The purpose of this study was to assess the experiences of patients discharged from intensive care units. 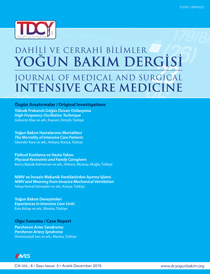 Material and Methods: This descriptive and cross-sectional study was conducted with 190 patients who were hospitalized in intensive care units for 24 h and over in a university hospital and a public hospital in Manisa, Turkey. Data were collected by a demographic questionnaire and the Intensive Care Experience Scale. Mean±standard deviation, percentage, Pearson correlation coefficient, and Kruskal–Wallis and Mann–Whitney U tests were used in the statistical analysis. Results: The mean age of the patients was 56.6±10.8 years, and 60% of the patients were males. It was found that the patients’ awareness of the environment in the intensive care unit subscale score of the Intensive Care Experience Scale was significantly different depending on gender and the length of stay in the intensive care unit (p<0.05). It was found that the patients’ satisfactions levels about care the in intensive care unit subscale score of the Intensive Care Experience Scale was significantly difference depending on the type of intensive care unit and the length of stay in the intensive care unit (p<0.05). Conclusion: The results of this study show that being aware of the environment in intensive care unit was dependent the length of stay in the intensive care unit and gender and that satisfaction levels about care in the intensive care unit were affected by the length of stay in the intensive care unit and the type of intensive care unit.